Scroll down or go HERE to check out my GD project for Jaded Blossom today. A fun new challenge starting today~come join in!!! 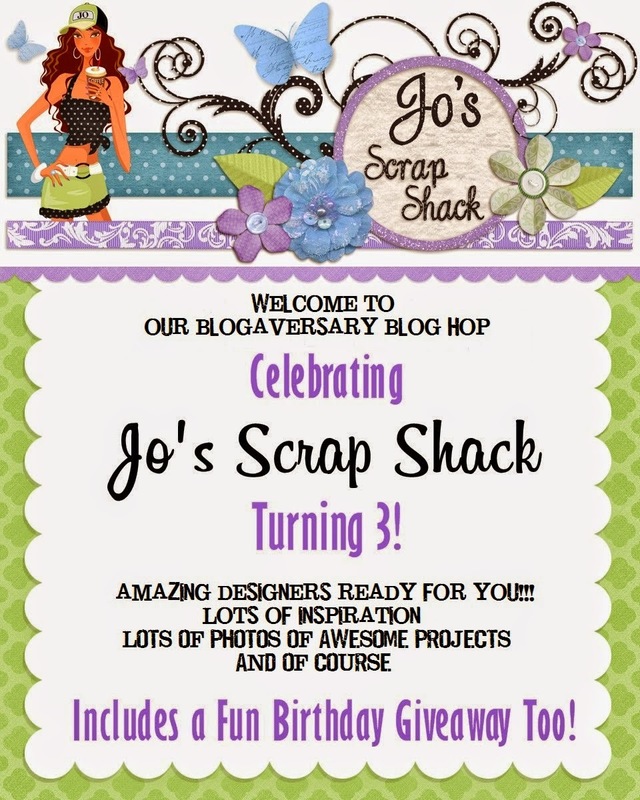 Today my sweet friend Jo at Jo's Scrap Shack is celebrating her 3rd yr Blogaversary!! So, what better way to celebrate with a blog hop! Yeah... I was thrilled she asked me to take part in the celebration. Of course, I said yes :) We'd love for you to hop along and check out the amazing inspiration and a chance at an amazing giveaway!!! So, if you are coming from Joyce's blog~Joyce's Creative Crafts, you are in the right spot. If you happen to stumble on this and would like to start at the beginning, be sure to start HERE that way you won't miss a thing. I also made a treat box using the gusset box from SVG Cutting Files. The gusset bag is from Jaded Blossom which is filled with yummy chocolates. I used the Dainty Topper Die for the topper of my treat and the sentiment is stamped with again the Supersized Birthday Greetings. The cute little candles are from the Birthday Dies and the number 3 is from the Wrap it Up cartridge cut at 1". 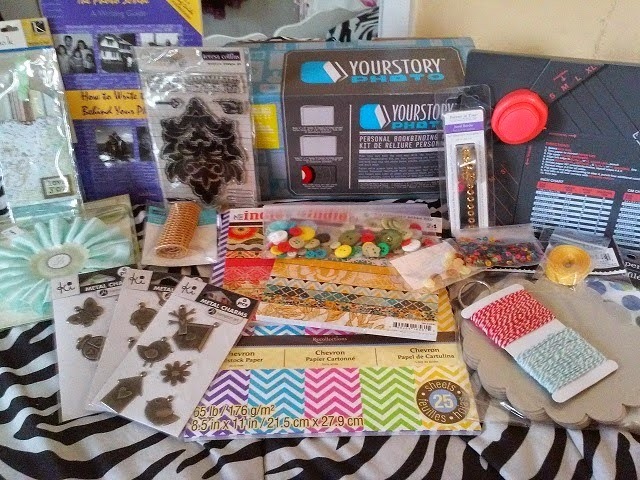 Look at this amazing package of goodies that Jo is giving away in celebration of her 3rd Blog Anniversary...Wahoo!!! Have a great day and "thanks again" Jo for including me in your awesome Blogaversary Party! Congrats to a great 3 yrs!!! Don't forget to stop back tomorrow to see the start of the sneak peeks for Jaded Blossom May Stamp Release which I am Guest Designing for! Wahoo~it will be a busy but fun week!!! Lovely little elephant guarding her chocs! Love the gift bag too. What a adorable projects, Sherrie!!! I love them both!!! Have a great day. Wow super cute!! Love that little elephant shes just adorable!! This is too cute for my EYES!! I love the pink and gray on your gift set!! The elephant is just PRECIOUS! Can I just squeeze him, please...LOL! Such a pretty and yummy treat box TOO!! Super duper cute my friend!!! That is the cutest elephant. What a fun card. 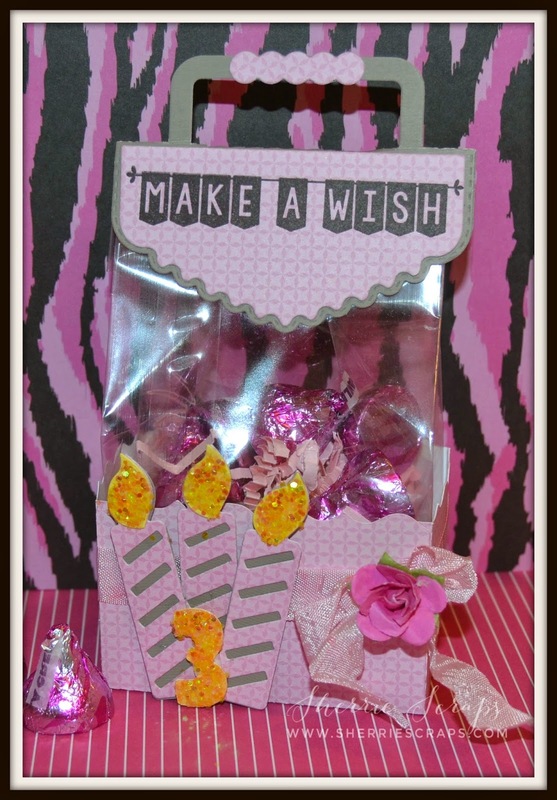 I like the candy wish bag. 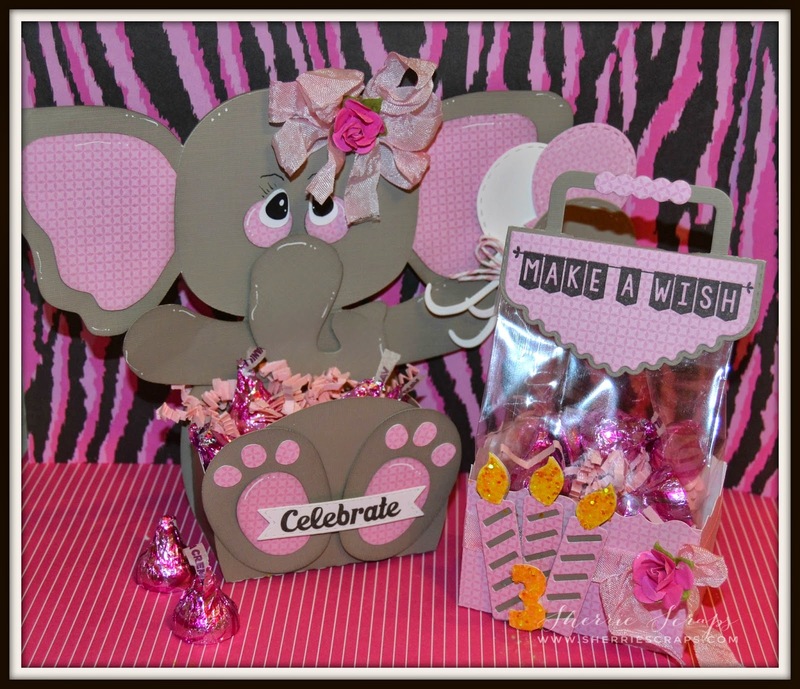 Very sweet project, that elephant belly box is just the cutest! Awesome candy bag too! Your projects are absolutely amazing! Love them to pieces! Have a great day! Love the treat boxes....you are very creative!! Aw, how adorably sweet is this little elephant, along with the treats it carries. And, in pink, my favorite color, too. Awesome and stunning. Awww . . . this is so adorable!! Both items are perfect to make a little treat just that much more special! Now this little elephant is just too darn cute. Love her face and big flower bow. Both boxes are too cute my friend. Soooooooo cute cute cute! LOVING that elephant!!!!!!!!!! Such fun projects. I really love the sweet elephant!! OMG girl your Belly Elephant treat box is so stinkin' cute!! OMG LOL definitely will bring life and laughs to the party. You really did an outstanding creative job and I love your treat topper for your bag it's so cute too!! You truly came up with Fabulous and Fun ideas. YOU so ROCK!! Love that elephant she is just cute!! So very cute! I am a new follower and look forward to seeing more. These are soooo cute. Thanks for sharing. That has to be the cutest treat bag ever!! Love the elephant!! Oh my cuteness! What an adorable little elephant-that face is so sweet and I love the bow! Your sweet little gift bag is just darling too. This makes such a wonderful gift set and I know that whoever receives it will love it! WOW! This is such a fun project ... totally adorable!! I'm so thrilled to be a part of this hop along with awesome crafters like you!! How cute would this be for a baby shower or baby gift? Thanks for sharing with us and I look forward to more projects from you. Such adorable Birthday projects!! I love how many goodies you were able to fit in this set :). I make goody bags for my college age son and his dorm mates, it's all about how much you can fit!!! 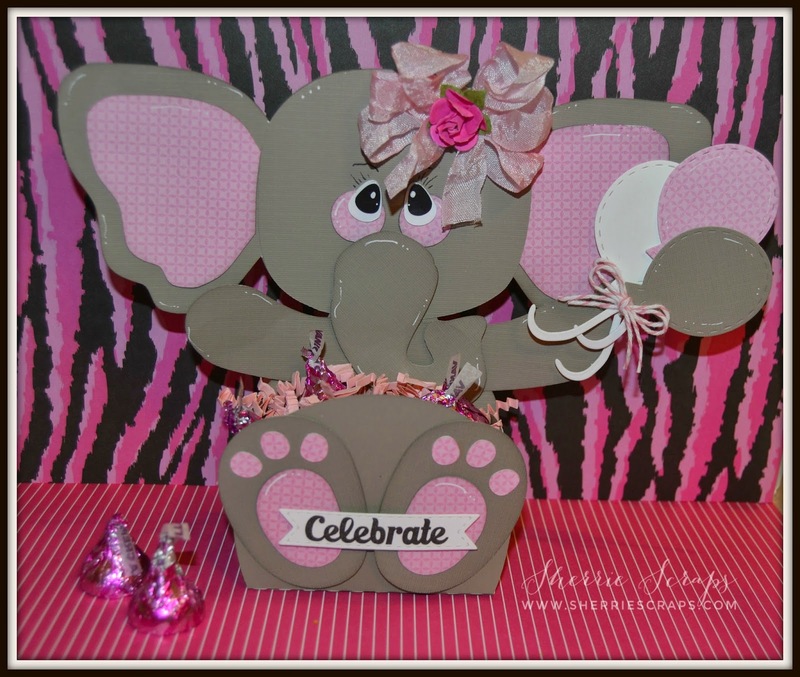 Your elephant belly box looks fabulous! Great way to celebrate Jo's 3 Year Blogaversary! Darling project! Love that cute elephant! Such ADORABLE projects Sherrie!!!! I am playing some catchup so I will be stalking for a bit. It has been a CRAZY few weeks around here with the start of Parker's house baseball and Travel baseball. Leaving me with little extra time so I apologize for not being around much. Awww! So cute. This just seems to shout fun and happiness. That is just too cute for words!!! How adorable is she. Love this little elephant and the treat bag. I am hoping along with Jo's Birthday hop and am a new follower of yours. Your treat box and bag are so adorable. Love that elephant! Such a fun set! I especially like the wonderful ribbon bow on your sweet elephant. What a great touch! Both treat boxes are so stinking cute. What a cute idea for a little girls birthday party. Especially love the elephant. This is so cute! Candy and adorable treat containers are always a big hit! Already follow you on Google! I just love your sweet little animal treat holders! So much fun! Wow, you've been busy my friend! Lots of CUTENESS to share! Love this adorable elephant and that bag!!! I love what you did with the bag - such a GREAT idea! AWE look at that elephant treat box! It's so CUTE!! LOVE the way you did the bow too ~ so girly and PERFECT! Reminds me of the hair things sweet little girls wear ~ Then the goodie bag ~ ADORABS too! As always LOVE you creations!